In "Creed II," opening in theaters Wednesday, Jordan's character, Adonis Creed, adjusts to his newfound prominence. If Michael B. Jordan's path to this moment was condensed and edited, it might look, appropriately, like a training montage. Images of Jordan cutting his teeth on the Baltimore streets of "The Wire" and the Texas football fields of "Friday Night Lights," followed by hints of a soaring talent ("Red Tails," ''Chronicle"), shattering breakthroughs ("Fruitvale Station") and setbacks ("Fantastic Four") before reaching, with a pair of haymakers ("Creed," ''Black Panther"), heavyweight status. "He's always been a big-idea guy," says Ryan Coogler, who directed Jordan in "Fruitvale Station," ''Creed" and "Black Panther." ''He's always been conscious of his own responsibility." 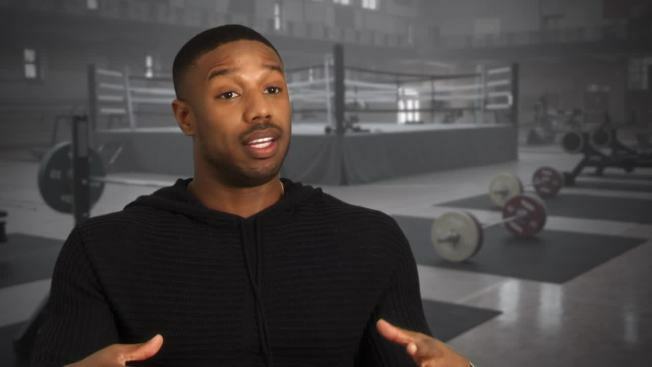 "Creed II," which opens in theaters Wednesday, finds Jordan's character, Adonis Creed — like the actor, himself — adjusting to his newfound prominence: reaching the pinnacle of his profession while still having to fight for what he believes in. As Steven Caple Jr.'s boxing drama prepared to open in theaters, Jordan went door-to-door in Georgia urging people to vote in the midterm elections. "You've been doing one thing for 20 years. Constantly working at it, trying to grow and become successful, or whatever your version of success is. And then you have a moment in time where everything seems to be coming together at the same time. Everything seems to be happening. But you live in a society, in a world that's kind of going to s---," Jordan said in a recent interview. "So to be able to use one to help the other, is something. To try to find your voice." It's an answer with shades of Jordan's typical performance: earnest, thoughtful, tinged with pain. Then he exhales. "I don't know, man," says Jordan. "Honestly, there's a lot going on right now and I'm trying to find my place in all of it, professionally and personally." A big part of Jordan's quest was "Black Panther," in which he played Erik Killmonger. The part is ostensibly a villain, but in Jordan's hands, Killmonger — a wounded, fatherless warrior bent on reparations through violence — has a depth uncommon if not outright alien to comic-book films. Between Killmonger and the Wakanda leader T'Challa (Chadwick Boseman) is a larger dialogue, one fraught with history, between African identity and the African diaspora. "Making a movie, you rarely come out the other side the same. You either grow or regress. I came out a different man," says Coogler. "The conversation that was had between T'Challa and Killmonger, what it means to be African — I didn't know I needed that movie as much as I did until after I made it. I look back and I say: 'Man, I really needed that. I needed that conversation.'" The performance has made Jordan one of this year's leading supporting actor contenders for the Academy Awards. Coogler praises his friend's vulnerability in a complicated role. "He was one of the few African-American characters and he was carrying the weight of that cultural representation," says Coogler. "Mike brings a lot of the empathy with him, as a person and as a performer. That's one of the things that makes him special. Almost as soon as you see him, you empathize with him." Just as "Creed II" is opening in theaters, "Black Panther" is returning to them. On Nov. 27, it screens for free in arthouse theaters nationwide, a few months after wrapping up its $1.35 billion run worldwide. "Black Panther," the year's biggest domestic blockbuster and most resonant cultural event, left a mark on Jordan. "Playing Killmonger, carrying that oppression, that feeling of being a representation of the African diaspora, I felt a certain pressure and responsibility to get it right. That was a very maturing process for me," Jordan says. "To be very unapologetic, I had to play that role." A sequel to the acclaimed 2015 spinoff (it grossed $173.6 million worldwide on a $35 million budget), "Creed II" was fast-tracked by MGM in part to capitalize on the success of "Black Panther" and Jordan's growing profile. Caple, whose feature debut was the 2016 indie film "The Land," had his first meeting with producers around Thanksgiving last year. By the first week of January, he was in Philadelphia getting ready to shoot. Caple preserved and expanded upon Coogler's naturalistic approach, and the film's best scenes unlock raw intimacies outside the ring. Especially notable is the chemistry between Jordan and Tessa Thompson, who plays Adonis' girlfriend ("Mike feeds off of Tessa a lot," says Caple), and the surprising pathos of the father-son relationship between Ivan Drago (Dolph Lundgren) and Viktor Drago (Florian Munteanu). In an echo of "Rocky IV," the younger Drago is Adonis' foe this time. Caple credits Jordan for the film's emotional authenticity. "He's genuine. Then you meet him in person and you realize he's the same way in real life. You can't act that or fake that. He used that as a vehicle to get where he is today," says Caple. "Right now, he's expanding on that with his business, with his production company, with his brand, and still being for the people in many ways." Jordan recently finished shooting "Just Mercy," in which he stars as civil rights defense attorney Bryan Stevenson. The Warner Bros. production was the first Jordan made with the inclusion policy in place. "The set, the crew was very diverse, all very capable. It was a great experience. Hopefully other studios and other productions will follow our lead and demand the same thing from their sets," says Jordan. "Change takes time. It's a small step, but it's the first step. I'm not expecting Rome to be built in a day."